Striata, a global leader in secure digital customer communications, is successfully enabling insurers to eliminate paper. 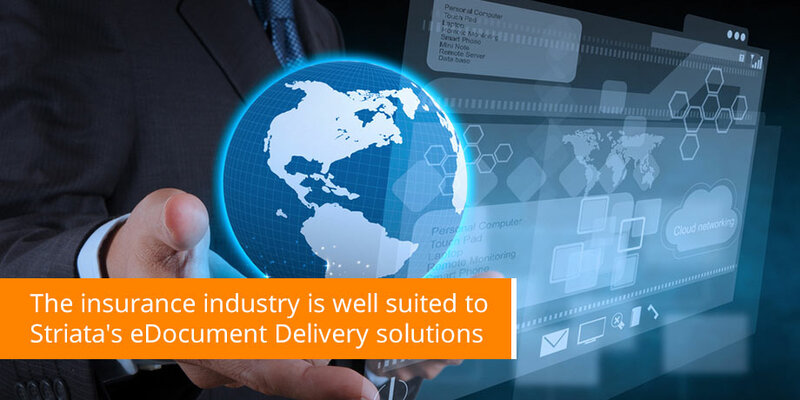 Insurance is an industry sector well suited to Striata’s eDocument Delivery solutions. With proportionately more expenses stemming from extensive paper output than most, insurers have significant cost savings to gain by turning off paper. Insurance companies worldwide are using Striata solutions to replace policies, updates, notifications, statements and bills with electronic documents that are delivered directly to customer and broker inboxes. The ePolicies solution is just one example of the cost saving services that Striata provides for insurers. With a typical insurance policy running 30 pages or more, the quantifiable saving per policy averages more than $6, and significantly higher for complex commercial policies. While impressive, these savings are not limited to the initial printing and postage. Industry regulations require that insurance companies generate and deliver a new policy or amendment for every change made. The true costs of paper usage therefore include reprinting and resending. In some cases, policies are also printed by the broker, a process which further compounds the expense and associated environmental impact. Adds new touch points that bypass Do Not Call and Do Not Mail lists, providing valuable up and cross-sell opportunities. Insurance clients are realizing considerable savings with Striata eBilling, a specialized solution to replace paper bills and statements. However, paper reducing challenges facing insurance industry billers have added complexity: the multiple lines of insurance commonly offered by insurers often function as autonomous business units, requiring a bill payment and presentment model that facilitates consolidation. Striata’s eBilling solution addresses these complex billing conditions with consolidated, multiple recipient electronic invoicing that is tailored to the specific needs of commercial insurance lines. Electronic documents replace paper invoices and are easily forwarded via email for multiple approvals – a typical barrier to electronic B2B billing. Delivered to customer inboxes as secure attachments, Striata’s electronic bills and invoices include a unique payment opportunity that allows customers to make an electronic payment with just one click from within the secure eBill itself. The ability to pay from within the eBill itself, without logging in to a website, is proven to encourage faster payments by customers. Insurance clients using Striata’s eBilling and payment solutions are benefiting from significantly reduced Day Sales Outstanding (DSO), allowing them to reduce their average time to pay by more than 50%. Delivered faster, opened sooner, and paid far quicker than paper bills, Striata eBills help insurance clients improve cash flow and maintain an important competitive advantage. Striata provides services and strategies to some of the largest and well known insurance brands including AIG, Chubb, Arrowhead, Sierra Health, Plymouth Rock and Allianz. These clients are successfully using Striata solutions to replace paper intensive processes with cost effective electronic document delivery that reduces costs and improves cash flow, assisting them to distinguish themselves in their market. ePolicies – When insurance in Massachusetts was deregulated, Plymouth Rock needed a way to differentiate themselves from larger insurers with significantly higher marketing budgets. Plymouth Rock selected Striata ePolicies as a unique product offering that could emphasize the value of personal relationships between brokers and customers as well as call attention to their commitment to preserving the environment. In an industry where service is a major differentiator, Striata’s solution enhances Plymouth Rock’s exceptional customer care. Consolidated B2B invoicing – A United Healthcare company, providing health insurance services to businesses was looking to reduce its billing costs and required a solution that could cater to its complex invoicing requirements. Striata provided the business with secure, consolidated, ePayment enabled, electronic PDF invoices delivered via email. Driving paper turn-off – An insurance company implemented Striata’s ePolicy Solution with a vigorous customer roll out schedule involving the distribution of introductory opt-out emails. It has since achieved a remarkable 15% paper turn-off in the first 7 months. Not only is it more cost effective for insurance companies to distribute ePolicies than paper; customers also prefer receiving them in this manner for convenient storage and archiving purposes.